Hiking in the Sierra Madres is an activity that I have enjoyed over the past several years. To my mind, there is nothing more spectacular than to be able to stand at the top of a peak and view the lake in its entirety, from Jocotopec to La Barca, to take in the splendour of the Colima volcano, and, in early March, the purple blossoms of the jacarandas. The satisfaction at having ‘made it’ can only be shared with and appreciated by fellow hikers!! What I also find enjoyable are the different types of terrain to be found in Mexico; I recently had the chance to hike in the Copper Canyon area, around Chihuahua, and, not only was it spectacular and very different than around Lake Chapala, I was also reminded of Algonquin park, near our home in Canada, with the pines, rock formations, and bird life. For those of you that enjoy the adventure and exploration possibilities, the sky’s the limit! However, serious hiking requires some forethought and planning; one has to be aware that this is not a totally benign activity, and that if something untoward happens, you can be several hours from help. For starters, you should be in reasonably good shape. Remember that you’re starting from an elevation of about 5000 feet, and that the highest elevation in the area is around 8000 feet. Because of this elevation, there is less oxygen available to muscles (including the heart muscle), and it doesn’t take long to become aware of this – you become quickly short of breath, your heart pounds, and you find that you have to proceed at a slower pace. For those with medical conditions, whether this might be heart or lung disease, arthritis, or diabetes, it’s a good idea to start out with walks into Ajijic, gradually going from 30 minutes, and working up to 60-90 minutes; this will give you some idea whether you can tolerate adding some mountain climbing to your regimen. 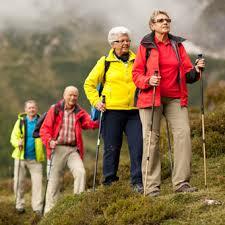 If you do have medical conditions that are not stable, it is not wise to attempt any significant amount of hiking. It is important therefore to become acclimatized; for beginners, you can start with a relatively easy hike to the chapel above the top of Colon street in Ajijic, an elevation of about 500 feet that should take you from 30-45 minutes; if you feel up to continuing, you can take a number of trails from this point, ending at the ceremonial grounds, or at the Tepalo waterfall; for the really hardy and adventurous – the top of the Chupanaya; however, if you are planning a longer hike, make sure you go with an experienced hiker. What hiking preparations do I recommend? First of all, layer your clothing, as you usually start in the cool of the morning, and by noon, the temperature has increased significantly. Good hiking boots, a pack, and plenty of water, are essentials. Anything other than hiking boots just don’t provide adequate footing, so these are definitely a wise investment. You can either use a fanny pack, or back pack, depending on your preferences. It’s most important to drink frequently, before you notice yourself getting thirsty – if this happens, it indicates that you are already mildly dehydrated; alcohol and caffeinated drinks are poor choices because they increase urine production. Make sure that you have enough water; if you’re hiking for 6-7 hours, you will likely need at least 2 liters. I personally like to use a walking stick; I find it most helpful particularly on my way down – that’s the time a lot of stress is placed on the knees; two walking sticks can also be used in fashioning a stretcher, if this situation arises. A first aid kit is also a good idea – even if it only contains bandages, tensor, and antihistamine. Bring your camera and binoculars; you will see different hawks, vultures, falcons, although not much in the way of wildlife. Optional items are a GPS and/or compass; in our area, it is not difficult to orient yourself to the lake. Gigi has assured me that there are no African killer bees in the area; there are some scorpions and the very occasional snake, so you need to watch where you’re sitting! It’s a good idea to let someone know where you are hiking and when you are expected to return. Don’t hike alone. For the sake of completion, I would like to mention altitude sickness, or acute mountain sickness, which is seen in people who have recently arrived at high altitude or have just gained altitude. It is caused by the body’s attempt to compensate for the lower oxygen levels that occur at high altitude; about 25% travelers who live at sea level experience altitude sickness when visiting destinations at elevations over 7500 feet; above 10,000 feet, 50% of travelers are affected! Headache, nausea, and light-headedness can progress to the more serious and potential fatal syndromes of HAPE (high altitude pulmonary edema, and HACE (high altitude cerebral edema); the variety of medical problems which may occur, are related to lowered blood oxygen with increased altitude, and the body’s attempt to compensate for this lower oxygen level. This is not a problem that I would expect a hiker to experience in our area, but someone who is a serious hiker, should be aware of this potential problem. The most effective prevention is graded ascent, adequate hydration, and appropriate use of medication (Diamox); ‘getting in shape’ prior to climbing doesn’t provide protection against altitude sickness; the definitive treatment for severe altitude sickness is immediate descent. Hikers in our area are usually below the significant altitude. However, I have had the personal experience of developing mild acute pulmonary edema when I flew into Cuzco, Peru, at an altitude of over 11,000 feet, and I can attest to my unhappy state of affairs, involving shortness of breath, extreme fatigue with minimal exertion, insomnia, and cough. This is correctable with Diamox, which is a diuretic, so that anyone anticipating traveling to an area where they may be at an altitude of over 10,000 feet, would be advised to have a supply of Diamox. These problems usually don’t occur if you are below 8,000 feet, and will usually settle with a few days of acclimatization.